In the presentation, I will be going over the basics of Amazon and how to sell on and to Amazon. Amazon has multiple sales channels, ways to market and fulfillment opportunities on their platform and it can be tricky to navigate at first. 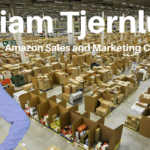 I’ll cover which sales channels work best for which business models and give an A-Z walkthrough from setting up an Amazon account to shipping inventory into their fulfillment centers. My name is Will Tjernlund. I have been selling full time on Amazon for over 3 years. I have sold millions of dollars to and on Amazon and now run an Amazon consulting agency where we manage the accounts of multi publicly traded companies.